Diocletian, AD 284-305. Bronze follis. Size : 27.3 x 28.8 mm. Weight : 9.98 grams. Obverse : Head of Diocletian right, with IMP C C VAL DIOCLETIANVS P F AVG around. 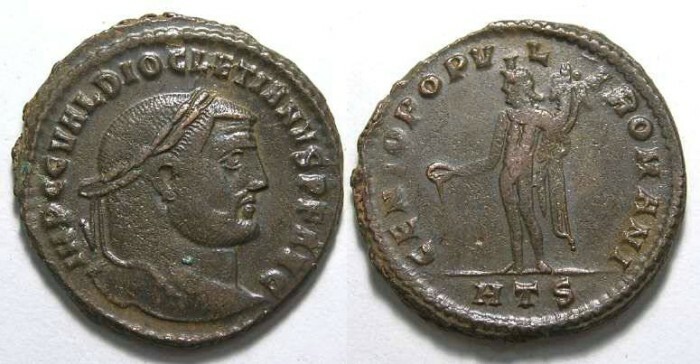 Reverse : Genius standing left, wearing a modius on his head, holding a cornucopiae and patera, with a chlamys over his shoulder, with GENIO POPVLI ROMANI around. Mint mark HTS (Heraclea, 6tht officina) below.